Heat the oil or butter and saute the onion and celery until softened, about 8 minutes. Add the parsley for a minute, then add the cabbage. Toss in some salt and cook, stirring, until the cabbage has wilted down, about 6-8 minutes. Add the stock, bring to a simmer, and cook slowly for 30 minutes or so. 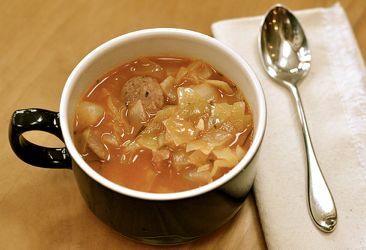 While the cabbage simmers, cut the sausage into half moon slices and brown in a skillet. Remove the sausage with a slotted spoon, then add the mushrooms and saute until they are softened, about 6-8 minutes. Return the sausage to the skillet with the peas and set aside until the cabbage finishes simmering. Add sausage-mushroom-pea mixture to the soup and warm through. Taste for salt, adding more if necessary, then serve warm with additional parsley for garnish.